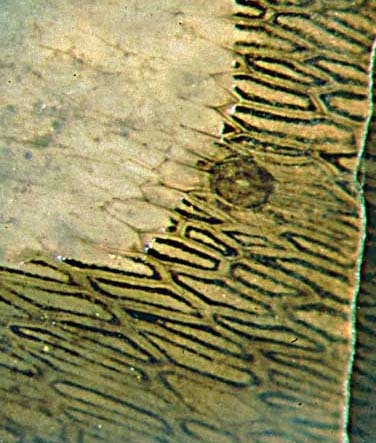 Photograph: Slanting cut of Aglaophyton shoot with conspicuous surface pattern consisting of peculiar dark frames inside the epidermis cells. Drawing: Pattern drawn for better visibility of the cell walls faintly seen there. Apparently some dark substance is arranged such as to make a plane frame within every epidermis cell, fitting to the shape of the cell and keeping a rather even distance from the lateral cell walls. 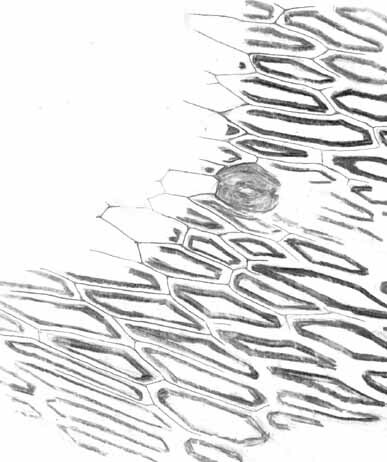 The outer edges of the epidermis cells are faintly seen as thin lines forming a network of polygonal meshes right between the dark frames. In some places where the frames have been cut, a tiny bright spot or line of reflected light is seen. This means that the polished chert face is not plane there. Hence one can conclude that the dark matter of unknown origin is mechanically different from the surrounding chalcedony. No explanation is proposed here. Suggestions are welcome.